How Far Can Tiger Woods Hit a Golf Ball? A few of the elements that generate Tiger's distance are club head speed, torque, hip rotation and balance. Tiger Woods is the No. 1 player in the world because of his talent, mental toughness and power. His ability to drive the ball off the tee and reach par-5 greens in two shots is a major reason that he has been successful in the toughest golf environments. By outdistancing most of his opponents, Tiger has a distinct advantage over his competitors. 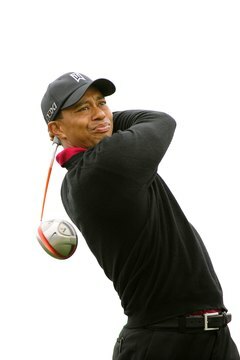 Tiger uses a specific technique when trying to hit the ball an additional 20 yards, saying he moves his lower body before impact and snaps his left leg straight, which allows his hips to clear faster. The move also speeds up the movement of his arms, shoulders and legs and increases his swing and club-head speed. Tiger Woods distance varies from club to club. According to Golf Digest, Tiger hits the driver an average of 285 yards with carry. His long irons (2- to 4-iron) range from 250 to 200 yards. His middle irons (5, 6, 7) range from 208 to 172 yards. His 8-iron travels 158 yards, and 9-iron flies 142. Tiger attributes his success to long shots to a quality swing. His takeaway and backswing require him to swing the club back with the shaft in line with the ball to follow through solidly. The club head moves inside during the backswing. At the top of the swing, Tiger's head moves down, and the club face reaches parallel to the ball halfway on the downswing. As he follows through, the club face meets the ball straight on as his weight shifts from his right foot to his left. Shifting his weight and keeping his head down help Tiger keep his balance; the force of the shot requires a powerful follow-through. For extra power with his driver, Tiger starts his tee shot with a wider stance than his other clubs. This adds balance because his driver swing is longer and wider. To accumulate power, Tiger also rotates the hips and shoulders like a spring. When his club reaches the top of the backswing, Tiger's hips and shoulders are set to unload. During the downswing, Tiger creates power by turning the hips and squaring the shoulders to impact. This combination of body movements allows Tiger to generally hit the ball nearly 300 yards, and sometimes farther, with the driver. Tiger hits his 2-iron 240 yards and his 4-iron 205. He achieves maximum distance when he strikes the ball solidly, with his body in balance and under control. He swings with an athletic posture, aligning feet, arms and shoulders and with eyes square to the target line. He also relaxes before every shot. Tiger hits his 8-iron shots 158 yards with a 3-yard draw. In addition to the power Tiger brings to his 8 and 9 irons, he can actively play to the conditions and pin placement. He can add loft or punch the ball onto the green, sacrificing distance at his discretion. What Physical Attributes Make the Best Golfer? How Did Ken Venturi Practice? What Kind of Clubs Did Ben Hogan Use? What Is the Longest Fairway Wood in Golf?